The 950 Adventure has a pedigree other bikes in the class can only dream of. Originally designed to race in the Dakar, the road-going version made it onto the streets in 2003 with a carbureted 942cc motor. Instead of being a cumbersome overweight adventure bike with only minimal off-road credentials – this bike was different. Lively, reactive and engaging, the 950 re-wrote the rules of the adventure class giving serious overlanders a bike that could actually travel around the globe on or off-road. For most buyers who were unable to take a year off to ride to Timbuktu, the 950 still provided the thrill of knowing they could embark on a trip like that if they wanted to. Pitched directly against the class-leading BMW R1200GS, the KTM is infinitely better in some areas, but lagging behind in others. With a 21in front wheel and 18in rear, compared to the BMW’s 19in front and 17in rear, the KTM wins hands down in any off-road situation. Its competition DNA makes it unbelievably capable on the rough stuff in the right hands. It’s also over 40kg lighter than an R1200GS Adventure –crucial to manhandling it or picking it up after a crash. But while its light weight and agile handling has big appeal, it doesn’t have the same long-legged feeling as the BMW. With 200cc more, the GS is a more comfortable ride and far better equipped, making it a nice place to be whether you’re nipping to the shops or planning a 50,000-mile trip. Compared to the latest adventure bikes, the slab-sided 950 looks seriously dated. But it still falls into the category of ‘cool’ bikes rather than ones you wouldn’t want to be seen on. Its quirky looks have been engrained on our minds for the last decade and knowing that the bike was originally designed to race across the African desert gives it genuine kudos that other marques cannot match. If you see a fully kitted-out GS rider on the street, the chances are that you are thinking – “all the gear, no idea”. But if you see a 950 Adventure rider fully loaded you’re left wondering what continent they’ve just returned from. Any bike with a big diameter front wheel takes a bit of getting used to especially if you’ve come from a sports bike, but on today’s potholed roads it’s only a positive. With close to 100bhp, the engine has plenty of power along with a big presence which ensures you are taken seriously on the road. The downside is a tall and not particularly comfortable seat along with a crude instrument panel which is antiquated by today’s standards. It’s also got two fuel caps, which while looking cool does get a bit annoying when filling up. For £4500 you’ll get a 30,000-mile 950. While that may sound like a lot of miles there are examples of this bike that have done in excess of 100,000. 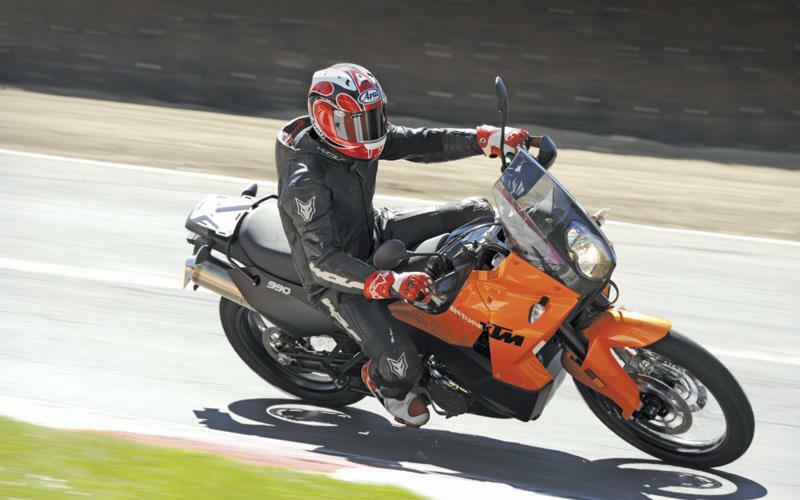 Contrary to popular belief, the big KTMs hold their value well – arguably suffering less depreciation than the BMW. Get insurance prices for this motorcycle and much more at MCNcompare.com. Compare 43 leading bike insurance companies in one place.